"Jackie" director Pablo Larrian called Natalie Portman, "our queen," while introducing the feature at AFI on Nov. 14. A tremendously pregnant Portman posed with the twins who play "Jon-Jon," Aiden and Brody Weinberg. 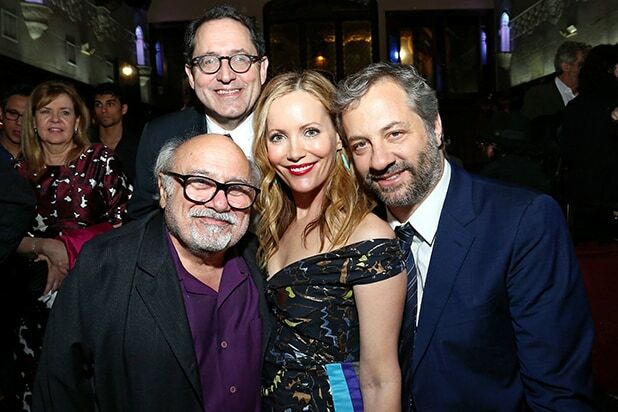 ... DeVito pops up out for a groupie with Sony Pictures Classics chief Michael Barker (back) and royal couple of comedy, Leslie Mann and Judd Apatow. While most parties were at the Roosevelt, this one crowded the Pig N' Whistle pub thanks to party partner Maestro Dobel Tequila. 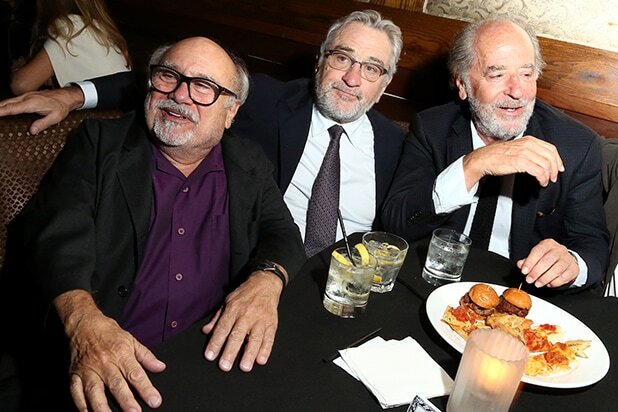 In De Niro's productive late-career turn to comedy, Robert and Judd have never worked together. Bring it on. After cozying up with Michael Barker, Leslie Mann engages the other half of Sony Pictures Classics' co-presidency: Tom Bernard. Ari Emanuel hugs "Patriots Day" director Peter Berg on the way in to the TCL Chinese for the closing night premiere of the Boston Marathon bombing movie. On the opening night of AFI, Sarah Jessica Parker got the eye of "Rules Don't Apply" writer/director Warren Beatty. What was Parker doing there? Her husband, Matthew Broderick, is in the film. "Just Visiting": David O. Russell and Matthew Weiner exemplify the most leisurely way to enjoy AFI -- as a guest. Here's the boss: AFI President and CEO Bob Gazzale schmoozes with Annette Bening at at A24's dinner on the roof of the Roosevelt on Wednesday night, November 16. "20th Century Women" cast Greta Gerwig and Annette Benning, with D.C.-based Audi CCO Jeri Ward, and Warren Beatty (at the dinner as a supportive husband). Mike Mills and Festival Director Jacqueline Lyanga. Each night Lyanga introduces the films she and her team selected for the 30th edition of the fest. PMK*BNC CEO Chris Robichaud, with client Jeri Ward who hosted the dinner, AFI's Bob Gazelle and A24's Daniel Katz. They dined while the movie screened across the street, getting it in before the after party. Cloris Leachman and Helen Mirren, the latter's "Collateral Beauty" arrives at Christmas. "Jackie" director Pablo Larrain told the crowd at the TCL Chinese Theatre that he searched the world for the actor to play JFK. He found Caspar Phillipson in Denmark. Now he's pulling up on Hollywood Blvd. in a sleek whip like this. Spot on for the Kennedy boys, right? Instead of watching NFL games on Sunday, Chris Pine and Miles Teller were two of the big names at Audi's Sky Lounge at the Roosevelt -- a sneaky celeb hideaway perched above the pool that includes the Marilyn Monroe suite. Sally Field and Rebecca Hall were also there with Pine and Teller, part of a panel of "Indie Contenders," meaning awards contenders from independent films. Here's the full class of 2016 indie contenders: Viggo Mortensen, Margo Martindale, Ruth Negga, Rebecca Hall, Chris Pine, Sally Field, Kate Beckinsale, Miles Teller and Adam Driver, with festival director Jacqueline Lyanga (in plaid). Super agent Kevin Huvane (CAA) with Lily Collins on AFI's opening night. Mary Chieffo hugs her mom, Beth Grant, at the "Jackie" party. Grant, who plays Ladybird Johnson, also starred in Best Picture winners "The Artist" and "No Country for Old Men." Meanwhile over in London, "Fantastic Beasts" threw a festive celebrity premiere on November 15 before it opened to $74 million here in the U.S. 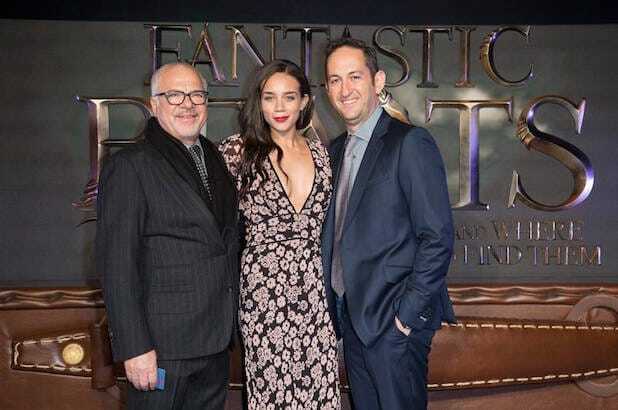 Appearing on the carpet: Paradigm's Sam Gores, actress Hannah John-Kamen ("Ready Player One"), and Warner Bros.' studio maestro Greg Silverman. That same night Ted Sarandos (left) and Judd Apatow (right) flanked Peabody Executive Director Jeff Jones at an event celebrating the new "Media Center at Peabody," a scholarly research center and digital media production arm of the prestigious Peabody Awards. The Media Center is on the campus of the University of Georgia in Athens, but the party was at Sarandos' home in West L.A., Netflix's favorite place to entertain.